This is another unusually busy card for me, but I think I quite like it! LOL! stamped images just would not pick up the Copper Embossing Powder! 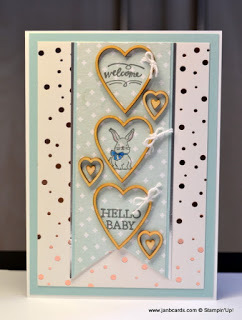 card is another example of how easy it is to mix and match Stampin’ Up! 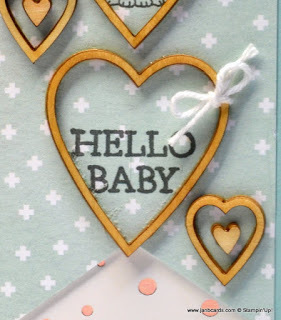 from the Moon Baby Stamp Set. are really beginning to grow on me! excellent value as you get 72 pieces for €7.50/£5.50. been playing with recently, too! were adhered to the card front, with Fine Tip Glue Pen. is the Naturally Eclectic DSP. Cardstock (CS), and then a layer of Silver Foil. layer of the Sale-a-bration (SAB) DSP which is called Springtime Foil. layer of Whisper White CS on top. 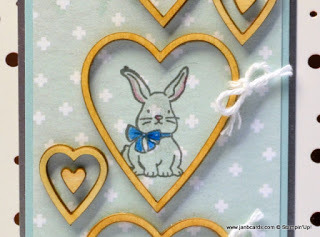 I love this card Jan, I like to mix and match my stamps and dies when necessary. I cannot think why the copper embossing powder would not stick only that your Versamark needs a top up thats all. I like what you did with the extra images though, great idea.